Beyond Chron exposes the rhetoric of an apartment owner association. The Oakland Tribune covers Saturday's rally in Oakland against Prop. 98. 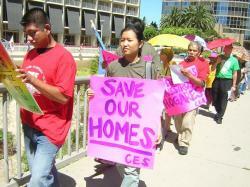 In Los Angeles, a wide coalition of groups came together to call on Mayor Villaraigosa and the City Council to accept Housing LA's three-point affordable housing proposal, which includes taking measures to protect existing affordable housing at risk of demolitions and condo conversions. This article in the L.A. Times describes lender harassment to evict tenants, including how a lender stopped paying the water bill in a bid to evict tenants from an Oakland duplex. Attorney General Lets Down 14 Million Tenants: Refuses to Include “Rent Control” in the Title of Prop. 98. 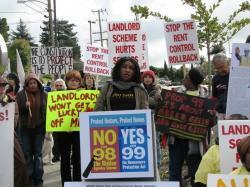 Landlord Landmark Equities must pay $10 million in fines and restitution to tenants! This L.A. Times article covers the impact of foreclosures on renters, with particular focus on Southern CA. The SF Chronicle covers the impact of foreclosures on renters, with particular emphasis on the SF Bay Area. This New York publication covers California tenants' effort to save rent control, and quotes Tenants Together Executive Director Dean Preston and board member Larry Gross. 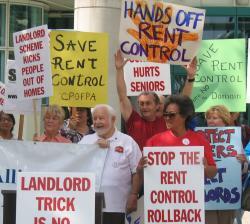 This article in the LA Times highlights the fight over rent control that will be on the June 2008 ballot. 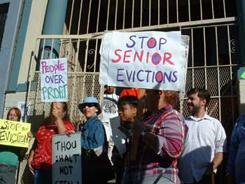 Inland's Valley Daily Bulletin presents the struggle of an increasing number of seniors in finding affordable housing. They’re Coming to Evict You! 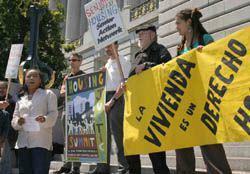 This article in Beyond Chron reports on the Tenant Convention in San Francisco against the initiative to ban rent control. This article highlights the impact of foreclosures on California tenants, an issue that has been largely ignored as the media focuses on the impact of foreclosure on homeowners. According to this USA Today article, many families affected by foreclosure are dealing with their housing problems by moving in with relatives. This phenomenon may contribute to increasing vacancy rates across the nation. "Foreclosure crisis reaches boiling point in Miami's Liberty City"
With the decision, the city can now form its rent stabilization board.